Explanation: This beautiful, bright, spiral galaxy is Messier 64, often called the Black Eye Galaxy or the Sleeping Beauty Galaxy for its heavy-lidded appearance in telescopic views. 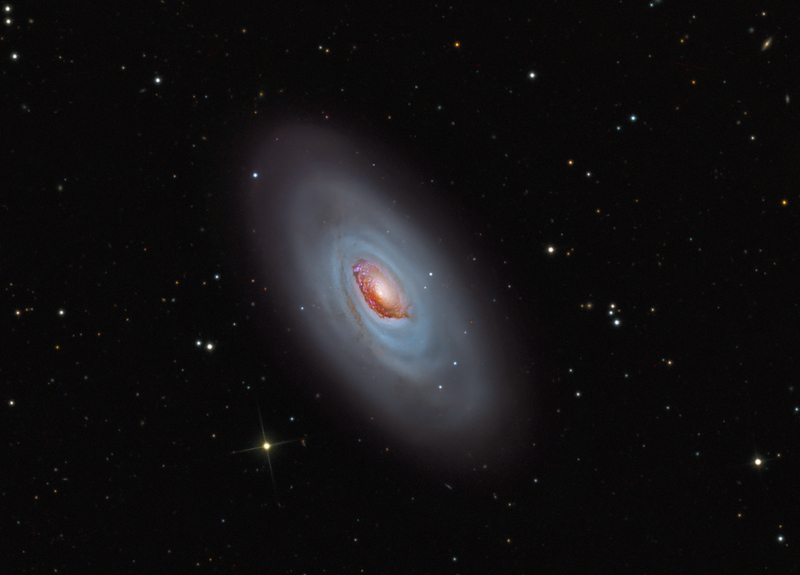 M64 is about 17 million light-years distant in the otherwise well-groomed northern constellation Coma Berenices. In fact, the Red Eye Galaxy might also be an appropriate moniker in this colorful composition of narrow and wideband images. The enormous dust clouds obscuring the near-side of M64's central region are laced with the telltale reddish glow of hydrogen associated with star forming regions. But they are not this galaxy's only peculiar feature. Observations show that M64 is actually composed of two concentric, counter-rotating systems of stars, one in the inner 3,000 light-years and another extending to about 40,000 light-years and rotating in the opposite direction. The dusty eye and bizarre rotation is likely the result of a billion year old merger of two different galaxies.